BARBARA COMPTON has been sewing since her teen years when she and her sister, BEV, took instruction from the Singer Sewing Schools. Always interested in handicrafts and creating unique gifts for family and friends, she and Bev, decided to go into business in 1996 when both of their lives gave them more time to sew and handcraft items. 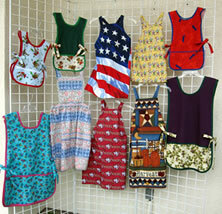 BEVERLY BROWN began sewing in 1956 and hasn’t stopped since. 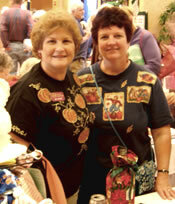 Both she and Barbara love the satisfaction and creativity B&B Designs has nurtured. Our business started with Beach Buddy beach bag totes (patented) in both child and adult sizes. Not wasting any fabric from our Beach Buddy beach bag totes, we started making hair scrunchies and our most popular item, reusable neck coolers. Most recent additions to our line include smocks and aprons in child and adult sizes, Christmas socks, kids coloring book totes and fabric bottle wrappers. B&B Designs began with orders for co-workers and friends and developed into successfully participating in local art & wine festivals. We plan to add more products to our website from our extensive repertoire of "fun with fabrics" handcrafts each of us loves to do. The Beach Buddy beach tote bag is a patented design. Both sisters grew up in San Francisco and currently reside in California (in the San Francisco Bay Area and the Sacramento area) where they hand make each item with care and expertise – a truly California original. or by calling (650) 588-2611 or (916) 434-6666 and leaving a message. Your call will be returned usually within 24 hours.